Great white sharks do not aimlessly wander the ocean waiting to stumble upon their next meal. Instead, the biggest sharks identify a location from which to strike, and then search the surrounding killing zone for their next victim. That suggests that the sharks use a premeditated hunting strategy akin to that used by some human serial killers. Scientists made the discovery while observing hundreds of great white attacks on fur seals off South Africa. Despite the reputation of many large sharks as effective hunters, few studies have examined whether they follow any pattern in their foraging behaviour. So shark experts Neil Hammerschlag of the University of Miami in Florida, US, and Aiden Martin of the University of British Columbia in Vancouver, Canada, decided to study the predatory habits of great white sharks hunting off Seal Island, in False Bay, South Africa. The island is home to some 64,000 Cape fur seals, which must swim across water that reaches depths of 20m just 50m from the shore. 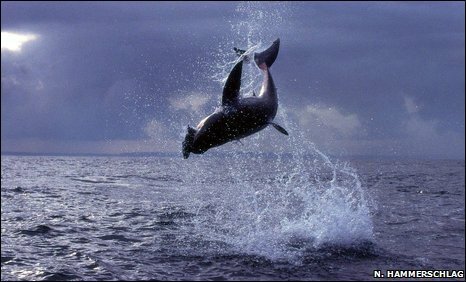 During the winter of 2004, the researchers observed 340 attacks by great whites on fur seals within 2km of the island. After each attack, the scientists recorded the precise geographical location and the depth of the water, as well as whether the attack was successful or not. To help analyse the attack pattern of the sharks, Hammerschlag and Martin then teamed up with Kim Rossmo, a criminal justice expert based at Texas State University's Center for Geospatial Intelligence and Investigation in San Marcos, US. Rossmo specialises in the geographical profiling of criminal acts, including those by terrorists and serial killers. For example, by using the locations of a series of linked crimes, such as murder or arson, it is possible to predict the location of a criminal's anchor point, usually a home or place of work. By applying these analytical techniques, the researchers established that great white sharks also follow a similar hunting strategy. The largest most dominant sharks would regularly pick a particular anchor point, and search for their next victim close to this location. Most large sharks regularly returned to a spot some 100m due south of the main place where seals came ashore on to the island. The anchor point did not itself provide the shark with the best chance of intercepting a seal. But the location did provide an optimal balance between detecting prey and capturing it. Smaller sharks seem to avoid competition with larger ones by widening their search strategy. 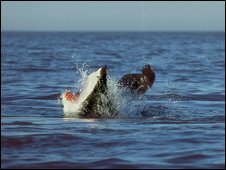 But they also tend to be less successful, suggesting that great white sharks learn through experience which are the best hunting sites. "White sharks, like other predators, may refine their search patterns with experience," the researchers write in the Journal of Zoology, published by the Zoological Society of London.